Pet slug, you ask? Yes, I know it's strange. I have had some strange pets before, including ladybugs that came through my window one winter. The thing about bugs are that they are so small that they don't require a lot of work, time and money to take care of. Slugs are super easy to care for... and very hard to kill (unlike plants). Slugs would be a great pet for a child, for all the aforementioned reasons. I have been seeing the same giant slug in my backyard over and over the past few weeks. I finally decided to pick him up (not with my hands, of course!) and keep him as a pet. I was reminded of the cute singing slugs in Flushed Away... If you don't remember them, check them out here. ... I wish my pet slug could sing and dance. :( Oh well, he (or she?) is still cute, in a slimy-gross way. All slugs need is a container with a mesh lid or a lid with air holes. If you are punching holes out of a plastic lid, be sure to poke from the inside out, so that the sharp edges are on the outside of the container. I used a glass bowl that I already had from my previous goldfish and some aluminum mesh for the top. For now, I am just using bits of blue painter's tape to hold the mesh down. These guys can be strong so make sure your lid is securely sealed! Place rocks in the bottom of your container. I used some stones I had picked up a long time ago from the dollar store. Cover them with water from a water bottle or water that has been sitting out for a few days. Water straight from the tap contains chemicals harmful to your slug. You will want to make sure your container remains damp but not soaking wet. You can use a spray bottle to keep it moist. Don't have large puddles of water because you don't want your slug to drown. Cover the rocks with dirt. I just used dirt from my backyard. Place some sticks and dead leaves inside for your slug to hide under. Slugs love to hide because they prefer dark, cool areas. I keep a towel over the bowl to keep it a little darker for my slug. 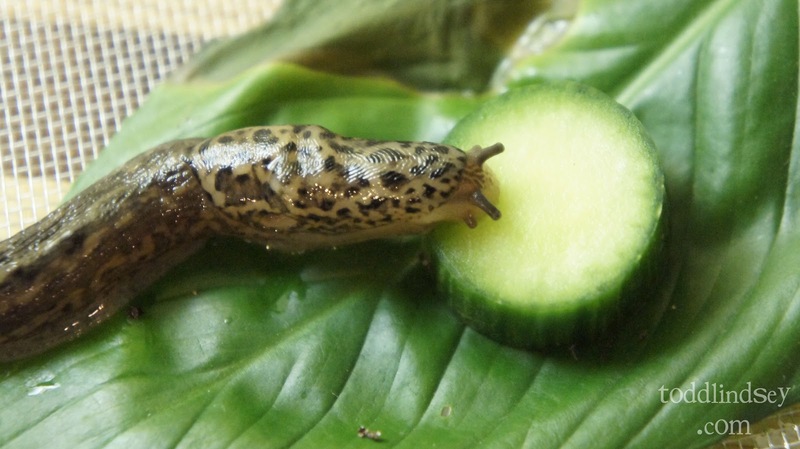 Slugs are very resourceful when it comes to food. Just feed them dead leaves or vegetables. 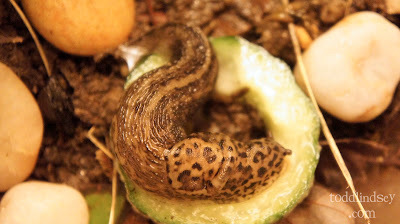 My slug loves cucumbers! He (or she?) was munching a tunnel through a cucumber slice for hours straight! It is so funny to watch them eat. They like romaine lettuce and other veggies as well although I have read that they can't eat iceburg lettuce. I also have read that they love grapes and strawberries and even a kernel or two of dog food! I will definitely be trying those sometime! As for cleaning, whenever you see the top layer of soil get all slimy, take a plastic spoon and scoop it off. Replace with "clean" dirt from your yard. Remove all food after a day or two or else it will start to stink and you may get fruit flies. And lastly, don't directly touch your slug! The chemicals on our hands and skin are harmful to slugs. And if you get tired of your pet slug, just carefully place him back outside where you found him!